Have students try these activities to expand their knowledge and interest in Extreme Weather. The greatest amount of rainfall, the highest and lowest temperatures, the person struck most often by lightning—the weather story is filled with record-breaking extremes. Have students prepare a Weather Records book. They can record all kinds of weather-related records. Encourage them to include graphics such as pictures, charts, and graphs in their record books. Many proverbs and idioms include references to weather and climate. Ask students to identify and define proverbs and idioms that use weather-related terms. You might suggest the following examples as well as encourage students to find examples of their own: April showers bring May flowers, it never rains but it pours, it’s raining cats and dogs, take a rain check; save for a rainy day, ride out the storm, weather the storm, hot as blazes. Have students prepare weather reports and present them in a weather news format. Encourage students to make weather maps, tables,and charts to use as visual aids in their presentations. If possible, have students check the weather channels for updated local weather to include in their reports. Have students model the greenhouse effect. Students might plant small plants in potting soil and place a thermometer in a clear glass bowl. They then should cover the bowl with a clear glass lid or plastic wrap and set the bowl in a sunny place. Have students place a thermometer near the bowl as well as inside it. Students should read the thermometers two or three times a day for a week. Carl Sandburg’s “Fog” and Christina Rossetti’s “Who Has Seen the Wind?” are just two of the many poems about weather. Help students find other poems in books or on online. Then have a poetry reading in which students read and discuss their poems. What should you do to protect yourself when extreme weather hits your area? Have students work in teams to make a safety booklet outlining steps to take in different weather extremes. Their booklet might detail what to do during thunderstorms when lightning strikes. It might identify what to do in preparation for a hurricane. It might list supplies that should be available if a blizzard or another storm results in power blackouts. 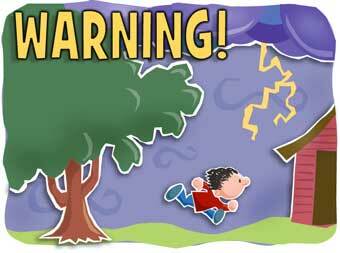 Encourage each team of students to research the safety procedures for a specific kind of storm. Then teams can compile their reports and bind them into a booklet. Have students model a tornado in a bottle. Fill a bottle with water, add a few drops of liquid soap, and a small spoonful of dirt. Securely tape an empty bottle to the mouth of the filled bottle. Hold the bottles over a pan or sink. Tell students to watch closely as you turn the bottles over. The water will swirl down much as a tornado swirls down.